New York, March 4, 2019: Kate Cannova, VP, Account Director for TBWA\WorldHealth was recognized with the 2019 New-to-Motherhood Working Mother of the Year Award. “Creating a gender-balanced agency is a priority at TBWA\WorldHealth and we are very proud to have nearly 60% of our executive and senior leadership roles filled by women. In a year where the International Women’s Day theme is #BalanceforBetter, we are thrilled to see Kate Cannova recognized with this honor.” said Robin Shapiro, Global President, TBWA\WorldHealth. Cannova, a 12+ year veteran of the healthcare advertising industry, having spent 9 years with TBWA\WorldHealth. 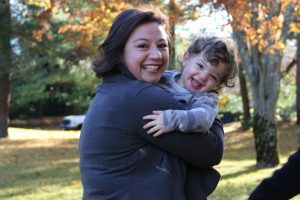 She is one of 22 recipients honored nationwide in three categories Trailblazer Moms, Established Moms, and New-To-Motherhood Moms chosen from dozens of nominations. The New-to-Motherhood Working Mother Award, presented by She Runs It (formerly Advertising Women of New York), honors marketing, media and tech leaders who skillfully navigate the multiple demands of work and motherhood while being strong models for their associates at work and their children (6 years or under) at home. The 2019 Working Mothers of the Year were honored, along with their children, spouses and partners, on Thursday, February 28th during a She Runs It sponsored awards luncheon at Cipriani on 42nd St., New York. TBWA\WorldHealth, a global healthcare communications agency, leverages the power of disruption and media arts to create behavior-changing ideas. TBWA\WorldHealth is part of the DAS Group of Companies. For more information, visit www.tbwaworldhealth.com. TBWA\Worldwide (www.tbwa.com) is a top-ten ranked global advertising collective that holds Disruption® at its core to develop business-changing ideas for brands. TBWA has 11,300 employees across 305 offices in 98 countries and also includes brands such as Auditoire, Digital Arts Network (DAN), eg+ worldwide, The Integer Group®, TBWA\Media Arts Lab and TBWA\WorldHealth. TBWA’s global clients include adidas, Apple, Gatorade, Henkel, McDonald’s, Michelin, Nissan, Pernod Ricard, Pfizer, Standard Chartered Bank, Singapore Airlines and Sotheby’s. Follow TBWA on Twitter and Instagram and like us on Facebook. Omnicom Health Group (www.omnicomhealthgroup.com) is a global collective of communications companies with more than 3,200 dedicated healthcare communications specialists. It provides marketing services to the health and life-science industries through a combination of specialized agencies, customized client solutions, and collaborations with other Omnicom network agencies. Organized around four customer groups—healthcare professionals; patients; payers; and medical, evidence, and regulatory stakeholders—Omnicom Health Group serves more than 100 clients in over 55 offices worldwide. Founded in 1912 as Advertising Women of New York (formerly AWNY), She Runs It exists to pave the way for women to lead at every level of their career in marketing, media and tech. With chapters in New York and Chicago, membership stands at over 3,800 women, men and corporate alliance partners. To learn more about She Runs It, visit Sherunsit.org.